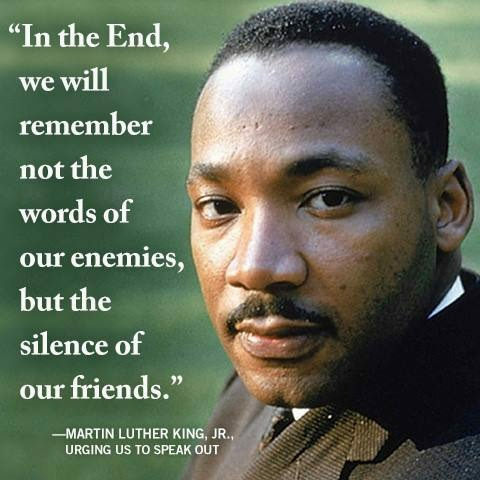 Sadly... it cannot be said that racism has been eradicated from the American conscience. 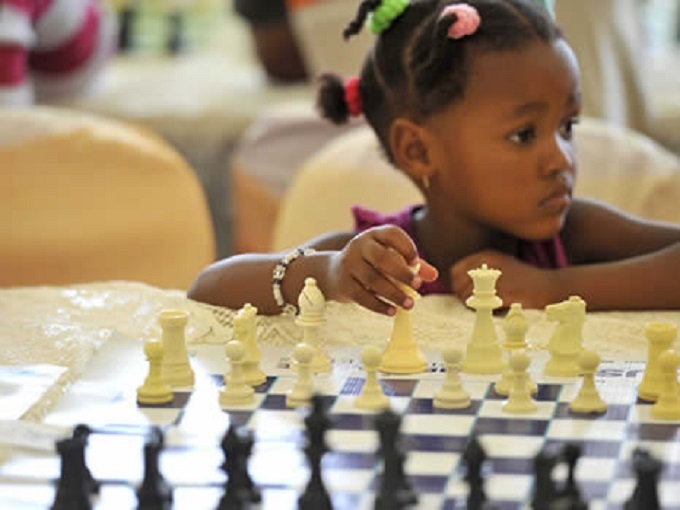 Once again the DCC staged a Tribute to Martin Luther King chess tournament. I am pleased that we say "Tribute to..." If anyone is deserving of gratitude, respect, and admiration, it is this man. The heading photo is from the Apple corporation homepage. As they have done in previous years, they chose to honor Martin Luther King's life and work in this way again. 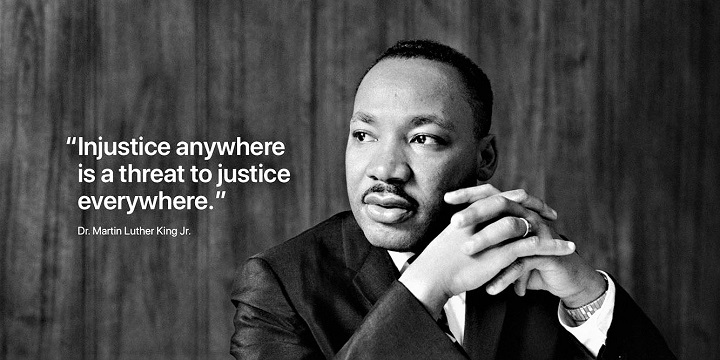 Dr. King was a tireless advocate for civil rights for all Americans. In 1983, after years of political posturing, his birthday was finally recognized as a national holiday. 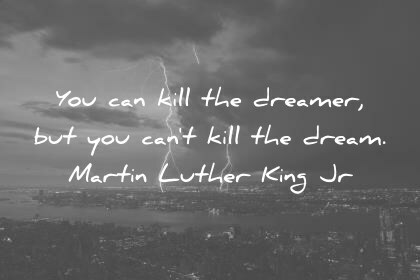 Quoting then President Ronald Reagan, “This year marks the first observance of the birthday of Dr. Martin Luther King, Jr. as a national holiday. It is a time for rejoicing and reflecting. 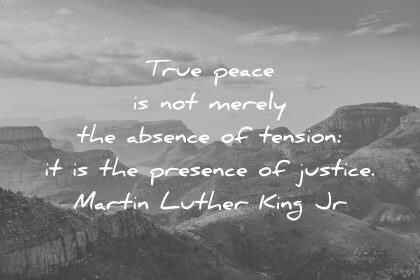 We rejoice because, in his short life, Dr. King, by his preaching, his example, and his leadership, helped to move us closer to the ideals on which America was founded..."
Sadly in 2019, 35 years later, it cannot be said that racism has been eradicated from the American conscience. A recent controversial internet video clearly shows a smirking white teenager facing off an Indian tribal elder. The young man now says he was smiling and trying to defuse the situation. Perhaps the one picture I saw was taken out of context, but If you can't tell the difference between a smile and a smirk, then I pity you. If you think African-Americans, or any other minority in the United States, receives equal treatment under the law, then you are deluded. If you think racial hatred does not exist in America then you are delusional. Quoting from a Denver Post guest opinion article by Steve Rendle, a Denver area businessman. "While America has clearly come a long way since the civil rights movement, we're reminded constantly in media and our daily interactions of how far we still have to go." He goes on to say his organization aims "to advance diversity and inclusion in the workplace." This is a white CEO recognizing that would be good for business. More power to him, I say. I'll never forget when I was a kid and saw two water fountains in a rural Alabama country store. The one labeled "Whites Only" was clean and set at a higher level than the one labeled "Coloreds" that was grungy and set lower. So a "colored" would have to stoop to drink. Made me sick to my stomach. We are all born on the same planet. 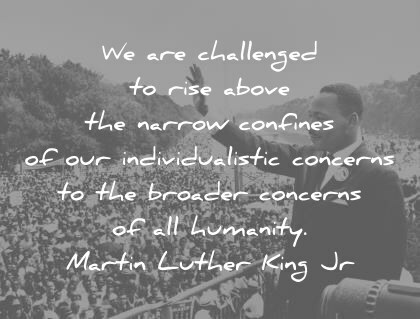 Skin color or ethnic background should be the very last thing that defines us. Not quite this many players were at the MLK, but we did exceed our expected number. In the Open Section with Gunnar Andersen playing, who do you suppose took clear 1st place. Right, and with a 5-0 score to boot. Mr. Andersen wins 375 dollars for his excellent play. (See diagrams #1 thru #5 below) Both Alaa-Addin Moussa and Sullivan McConnell lost to Mr. Andersen but otherwise won all their other games. Each finishing with 4 points and sharing the combined 2nd and 3rd place prizes. They each take home 187 dollars and 50 cents. Brian Wall was left out of the money when he gave up a draw to Griffin McConnell in round 2, and then lost to Sullivan in round 3. 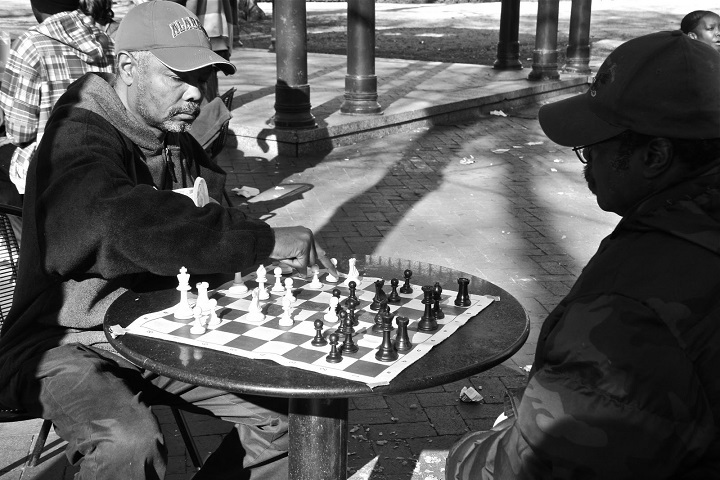 Many cities have an outdoor chess playing area. Brad Lundstrom, Calvin DeJong, Joe Hubler, Edward Yasutake, and Wesley Woo all ended up with 3 points and they share the 100 dollar U2000 prize. Everybody knows Mr. Lundstrom can play and Brian Wall says the young Calvin "is clearly a future Chessmaster. A bright star with a serious demeanor." 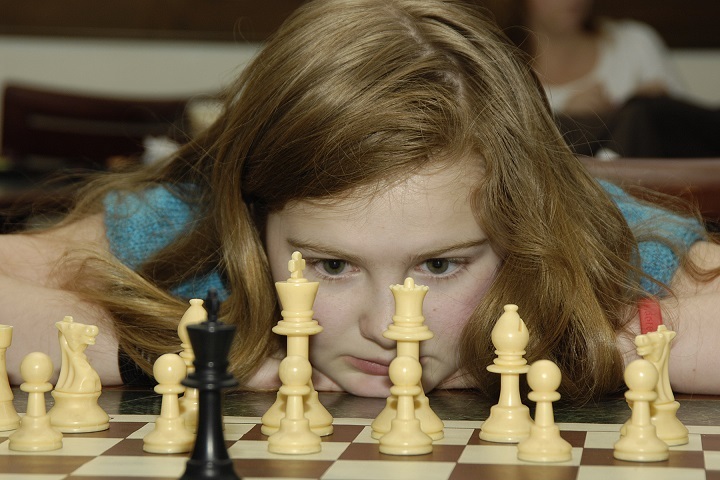 An intense young chess player. Wesley Woo is another young player who is likely to become really good at this game. Rated only 1612 He lost to Rhett Langseth in round 2, then had 4 upset wins or draws to achieve his score and he will probably gain over 100 rating points. Mr. Yasutake also earned his 20 dollars by upsetting much higher rated players; Richard Shtivelband in round 1, and Neil Bhavikatti in round 3. I don't know Andrew Roerty, but he is a young player that only lost to Mr. Mueller-Omar in round 2, and won all his other games. Finishing with 4 points to take clear 2nd place and win 150 dollars. 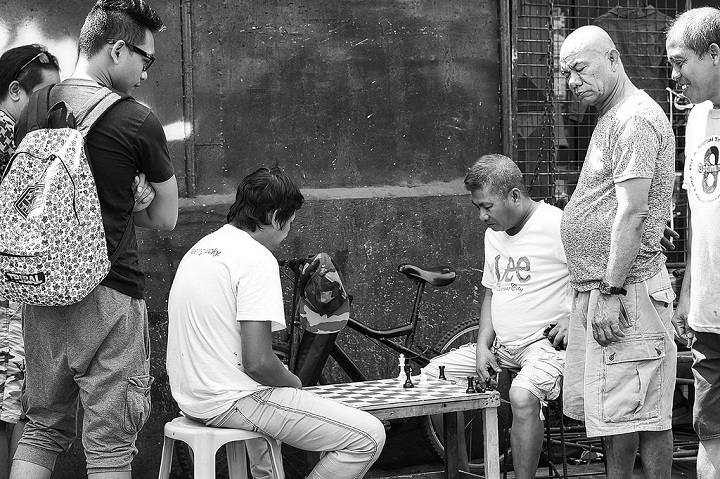 Sometimes we are more interested in another game than we are in our own. 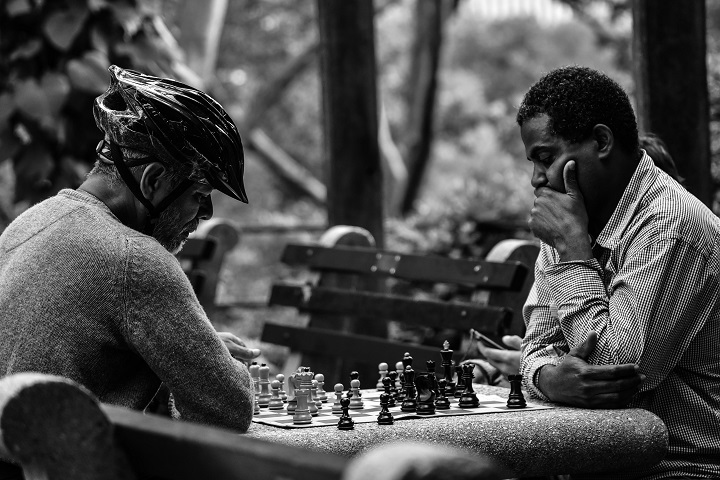 A break in a bike ride to play a game of chess. The U1500 prize in this section was shared by Derek Isabelle, Shiven Sexena and Nathan Woo. All ending up with 3 points and each wins 25 dollars. I was most definitely lucky to win against Derek in Round 1. A touch move slip cost my opponent a Bishop, but gave him passed pawns that I didn't know if i could stop till I finally noticed that a check would win his Rook too. Both Shiven and Nathan had 4 big upset wins or draws. Shiven only lost to the 2nd place winner in the last round. Nathan lost to the higher rated Harsh Mali in round 1. A small tournament being played who knows where. Congratulations to all the prize winners, and thanks to all the players who passed up watching playoff football to make this tournament a success. We'll start off the Games section with the Open section winner's games. Gunnar Andersen's 5-0 score is quite an accomplishment. 7) Haroun Mueller-Omar vs. Andrew Roarty. Round 2. Black has just played 20... Qd8-d4. Find the tactical shot Haroun plays in this position. 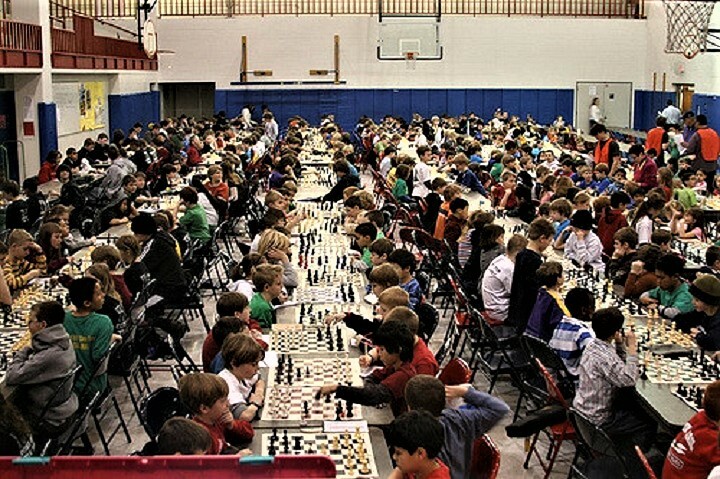 https://denverchess.com/games/view/18195 Mr. Mueller-Omar provides extensive analysis for this game that is well worth your time to peruse. 10) Haroun Mueller-Omar vs. Gary Bagstad. Round 5. In this opening position, Black played 7... Ng8-f6 and immediately resigned. Do you see why? https://denverchess.com/games/view/18210 A frustrating end of tournament loss for Mr. Bagstad, who would not normally play such a move. In the U1400 section, Coleman Arthur Hoyt did not hold up his end and make a 5-0 score. He only scored 4.5 points. :-) Coleman, like Haroun and Gunnar, is serious about improving his game, and I like that he posts most of them to the DCC site. Here are his games and the amusing nicknames he gives his self for each one. 16) Rhett Langseth vs. Vedanth Sampath. Round 1. In this position, DuWayne Langseth's son, Rhett, has just captured a pawn with 26. fxe4. Do you see how Vedanth wins a piece? 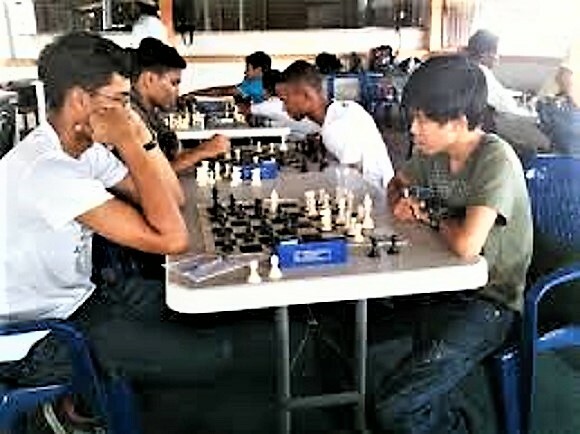 https://denverchess.com/games/view/18189 Vedanth is one of several young players who play regularly at the DCC on Tuesday nights. I cannot show that and not show this. A much more typical Brian Wall game. 21) The same game after NM Wall plays 25... Qg5-g2+ Brian of course gives this move two exclamation marks. I surprised he didn't give it at least three :-) Do you see the mate in 4?